The present level of knowledge about the structure of steppe giant mounds as well as determination of the fact of simultaneous existence of their submound burial assemblies permit widening the information field available from the study of elite Scythian mounds (Fig.1). On the one hand, it is necessary because all the highest burial mounds of steppe Scythia, being very densely arranged both in time and in space, are almost completely studied. On the other hand, wide “noticeability” of these relics has led to attempts of revision of their ethnic attribution. I. Marasov assumes that Low-Dnieper burial mounds of the Khomyna Mogila (Khoma’s grave) type belong to the Thracian nobles (Marasov 1988). R. Ismagilov believes that the whole assembly of the “Low-Dnieper catacomb culture of the 5 th and 4 th cent. B.C.” was left by the early Sarmatians (Ismagilov 1994, 71). That is why we think it necessary to face the problem of attribution of the Scythian tsars’ graves provided that most researchers are inclined to see existence of the single state power in the Northern Black Sea area in the 4 th cent. B.C. A brilliant conception advanced by B.N. Grakov on transformation of the Scythian society in the reign of tsar Atei who is treated as a unifier of Scythia (Grakov 1950, 9-18) still has its adherents and opponents. A conclusion which was based on a sagacious guess about the interrelation between pictures showing Heracles with a lion and ideas about origination of the new branch of the Scythian tsars from Zeus via Targitaus-Herakles and, in fact, purposeful appropriation of this symbolic picture either by Atei or by his clan (Grakov 1950, 12), has been supported by a ponderable argument after the discovery of Atei’s coin. This conclusion has been verified by a thorough mythological analysis of pictures and Scythian toreutics carried by D.S. Raevsky (1977, 164-170). The conclusions made by B.N. Grakov have been supported in the frames of historical analysis and developed by D.B. Shelov (1965, 18-19; 1971, 54-63), A.M. Khasanov (1975, 238-245), F.V. Shelov-Kovedyaev (1984, 146-147), V.I. Pavlenkov (1999, 194-196). They give Atei functions of the tsar who completed integration of Scythia as a whole under the guidance of the single central power and in whose reign the development of the Scythian state had reached its zenith. Another version treats Atei a local leader of the Scythians in Dobrugea. This opinion has many adherents, among them there are D.P. Kallistov (1969, 125-130), P. Alexandresku (1967, 91), V.A. Anokhin (1973, 39-40), E.V. Chernenko (1987, 81), S.I. Adrukh (1995, 75-80) and other. Sharing the views of B.N. Grakov in this discussion, we suggest our own indirect arguments and version that one of eminent tsar’s burial mounds is the grave of Atei. Comprehending that this assumption is very hypothetical because historical information is rather disperse and scarce, we still think it possible to propose our version. Besides, the process of chronological ordering of tsar mounds initiated by M.I. Rostovtsev and developed by the next generations of researchers (Rostovtsev 1925, 405, 432, 455; Brashiinskij, 1965, 89 – 109; Onajko 1970, 9-54) has been recently given a powerful incentive due to a series of suggestions made by A.Yu. Alekseev (1981, 75-83; 1984, 65-75; 1987, 28-39; 1992; 1993, 72-75; 2003). Such scientists as S.Yu. Monachov (1993, 68-70; 1999; 2003). and S.V. Polin (1993, 79-80; 1994, 105) have also contributed to refinement of dates of great Scythian graves. The works mentioned permit narrowing significantly a range of the most probable mounds of tsars proper, which makes it possible to construct a rather strict logic chain of relics. Pull-value information available on assembly Ohuz permits attributing it with confidence to not numerous group of tsars’ graves. That is why recognizing the largest three graves of the Scythian steppe as tsar graves (without quotation marks) we have to determine the time and succession of their appearance. The latest datings of Chortomlyk and Alexandropol’ state their chronological horizon as 340-320 and 325-300 B.C., respectively, and determine, in our opinion, the following tendency of their sequence: Chortomlyk – Ohuz – Alexandropol’. However, operations with absolute dates destroy at times this chronological chain. That is why it is expedient to use differentiating features when determining succession of these barrows. There is a steady statement for the 4 th cent. B.C. on existence of four tsars’ graves proper, i.e. we add mound Solokha to our chain. This 18 m high mound erected for two stages yields twice-thrice to giants of the second half of the 4 th cent. B.C. if taking into account labour expenditures, but in comparison with burial mounds of its horizon it may be referred with confidence to the range of tsars’ sepulchers. It is known at present that there are no more graves of such size in the steppe and forest-steppe zones of East Europe except for Tsarsky (tsar’s) mound on the Bosporus. One more indirect argument in favour of our chain is location of graves in space on one line, on a section of 126 km (from Ohuz in the south to Alexandropol’ in the north), i.e. on the so-called “tsar’s road’. That direction was probably the most important thoroughfare of Scythia and served a place for burying the most outstanding public figures: there were found the largest mounds of the Steppe (Deev, Kozel, Rogachik, Lemeshev, barrows near vil. Bolshaya Znamenka (№ 13 in particular); in the right-bank Dnipro territory there are, probably, Tovsta and Nechai Mogilas) (Boltryk 1990, 38-41). Limiting a range of relics we need to exclude the Nechai Mogila from the number of pretenders to the rank of tsar’s sepulcher, thought this grave is the largest one among unexcavated mounds of the Ukrainian steppes, its height (16,2 m) permits comparing it with graves Kozel and Tsimbalka which represent the next social stage. All other graves, the so-called “tsar’s” ones, irrespective of the significant wealth of their burial stock, are not taken into account because labor expenditures for their construction yield greatly to the range of graves mentioned above. Volumes of Ohuz, Chortomlyk, Alexandropol’ are 117, 82,4 and 77,5 thou. m 3 respectively, whereas Kozel and Bolshaya Tsimbalka, the closest to them by the height, are 33 and 32 thou. m 3. The next group of mounds consists of Zhovtokam’ianka, Lemeshev, Krasnokuts’ky, Babina, Gaimanova, Tovsta and Chmyreva Mogilas which volumes of barrows 7-8 times yield volumes of tsars’ mounds. It is interesting that Ohuz exceeds its neighbors in the group just by the volume of Kozel and Bolshaya Tsimbalka. In our opinion this difference is to be associated with the presence of the Northern grave in Ohuz. This grave caused construction of additional bank according to the social rank of the deceased. Between the time of construction of Solokha (late 5 th and early 4 th cent. B.C.) and the rest of tsars’ graves there is a chronological gap of fifty years or even more. This fact, striking as it may seem, may be explained if compare the mentioned chronological niche with the supposed period of Atei’s reign. Most probably the second grave of Solokha was a burial place of Atei’s predecessor (Mancevič 1987, 118; Alekseev 1992, 127, 162; 2003, 227, 229 -235) and the existing gap in time between Solokha and three other giant graves formed as there was no need to make sepulchers because tsars did not die. So, that mound of these three ones of tsars of the second half of the 4 th cent. B.C. which was erected the first is to be treated as Atei’s grave. Besides, it is advisable to analyze three burial assemblages with allowance for narrative information about the tsar. Let us discuss each of graves-pretenders separately. Mound Chortomlyk is studied most thoroughly and nevertheless, irrespective of numerous works devoted to it, this archaeological assembly still remains obscure. The careful analysis of findings reveals certain facts which change its traditional comprehension. 1 . At present asynchronism of an assembly of findings in Chortomlyk is proved convincingly (Alekseev 1987, 32; Alekseev, Murzin, Rolle 1991, 130). Existence of two burial assemblies in the mound is scarcely responsible for this fact. We think that the Northern grave of Chortomlyk is not an independent structure but a complex entry pit which served a beginning of a powerful inclined dromos to chamber 5, i.e. main entrance to the central part of the grave. Let us note that the dromos was considered as a robber-made hole from the time of I.E. Zabelin and all next generations of researchers apprehended that error as a proved fact (D.M. Anučin expressed not unfounded doubts on the occasion of this predatory way. He believed this underground passage 1,1 m in section – as it was considered – linked up underground habitation of “tsar and tsarina” with surface; besides it was used for bringing in the grave goods or for passing away soul of dead. He also pay attention to the passage of Chortomlyk which “was blocked up with stones from the outside and that was closed with two heavy slabs” (Anučin, 1909, 63-68)). The authors of the monograph devoted to Chortomlyk could not aveid that erroneous view. That is why we think it necessary to add arguments to our statement. Prior to the latest study of Ohuz long dromoses were traditionally treated as secondary structures which joined a subsidiary entry pit with a burial chamber of the central grave, which is obviously seen in dromoses of Alexandropol’ and Zhovtokam’ianka. But Ohuz trustworthily shows a principle of existence of two synchronous entries to one burial structure: via a long dromos from the south and via a ramp from the west. This fact made it possible to consider the outline and sequence of formation of burial structures with long dromoses in another aspect. They were single underground burial systems made at early stages of formation of mounds and the entrance to the dromos was made beyond the bounds of primary embankment. W. Herz, who made working drawings when completing excavations of Chortomlyk, had observed regularity in planning of its burial structures. He marked that the system of proportions of the Northern grave was analogous to proportions of the Central grave and he supposed that they were constructed under instructions of the same “architect” (Herz, 1997). This observation becomes clear if treat the Northern grave as a complex entry pit which crowned the northern end of the dromos. Besides, the outlines of Chortomlyk show that the width of the “robber’s hole” (i.e. dromos) coincides with the width of the upper part of the central pit, which adds to observations of W. Herz. It is very interesting that crosses of the “robber’s hole” of Chortomlyk almost coincide with crosses of the dromos in Ohuz in their shape and dimensions. So, considering the “robber’s hole” as a dromos, we obtain in the outline of Chortomlyk an element which we lacked previously and which significantly throws light to the situation around chamber 5. There are similar long dromoses in most of significant graves of the second half of the 4 th cent. B.C. In some graves they are treated as secondary passages (Alexandropol’, Zhovtokam’ianka), in other type – they were not identified (Verkhny Rogachik, Tolstaya Mogila), in some graves they were not studied (Kozel, Krasnokuts’ky mound). The “robber’s holes” in other mounds ought to be revised critically as well. In most cases they were dromoses (either horizontal or inclined) though, really, in the course of time they were used by robbers as water which penetrated to these passages decamouflaged the entry holes. The acceptance of the principle of simultaneous erection of the structures with long dromoses excludes one of the steady archaeological “legends” on the striking ability either of ancient builders or of robbers to hit their underground passages precisely in the definite parts of previously built underground structures and retaining with that the general symmetry of the primary structure. Reverting to Chortomlyk it ought to be mentioned that, as attribution of burial places of the subordinate persons and horses to the Central grave is indubitable, this relic is to be treated as a synchronous assembly constructed for one person. 2 . The burial assembly of Chortomlyk is the most “Scythian” of all three assemblies, it contains none elements of other cultures or borrowings. Certain amount of antique imports in the stock is in line with this statement as for the 4 th cent. B.C. it had been already a stable burial tradition. This fact is expedient to be compared with narrative information on the preference shown by the Scythian tsar to traditions of his people (Plutarch, Aphorisms… 16; 2,3). 3 . The authors of the monograph devoted to Chortomlyk have driven themselves in captivity of the attractive version advanced by D.A. Machinsky and A.Yu. Alekseev that the achemenidian sword found in the mound is a diplomatic gift made by Alexander of Makedon. The version is based on the authors’ comprehension of Arrian’s data (IV, 15/1), which in the end influenced determination of the general date of the assembly. Being a unique thing, the sword repeatedly attracted attention of specialists. Having studied that finding, A.Yu. Alekseev has marked that the cover made of thin golden plate and the blade are asynchronous and made in different cultural traditions. The fact of their combination the researcher has explained as the secondary use of the cast achemenidian cover of the 5 th cent. B.C. when trimming the Scythian blade of the 4 th cent.B.C. (Alekseev 1984a, 40,41). Attribution of the sword cover to the achemenidian art is proved not only by the mode of pictures, but, as R.S. Minasjan states, by the procedure of its performance (Minasjan 1997). He adheres to the version on the secondary use of the more ancient cover for the Scythian blade of the 4 th cent. B.C. In opinion of E.V. Chernenko there is one essential feature in the sword hilt which is not known in the ancient east and archaic arms but is intrinsic to Scythian swords of the 4 th cent. B.C. It is a part of the golden cover of the hilt, “a cuff”, which is lower than the cross and covers the upper part of the blade. A tracery blade is typical only of the Scythian assemblies of the 4 th cent. B.C., i.e. it is much younger than the sword cover. The sword from Chortomlyk is included by E.V. Chernenko to a list of the Scythian trophies in the war against Darius (Chernenko 1984, p.48-50). Thus, all researchers are inclined to the opinion that a new blade and a cuff made of gold foil were mounted to the old hilt. The version treating the sword as a gift can hardly be accepted as the sword looking as it was when it was excavated could not get to Scythia. Tracery blades and cuffs typical only of the Scythian relics of the 4 th cent. B.C. could be made only by native craftsmen. Besides, as we know from information made by E.V. Chernenko, the cuff bears traces showing its wear and this confirms that the sword was brought to the grave after the long-term use and in an altered form. Then, taking the version of E.V. Chernenko who treats the sword as a trophy of war, we may explain the fact of its availability in the grave. Probably, the sword was a relic of the kin and the old-age tsar so highly appreciated that arm of his youth that ordered to renew it as the blade was worn or on some other reasons. 4 . Bronze-made kettles look rather archaic in the Chortomlyk assembly. The typological classification of Scythian kettles of the Black Sea coast area suggested by N.A. Bokovenko shows one of kettles from Chortomlyk looking like those from Solokha and Raskopana Mogyla, the second – like those from the Upper Dnipro and Dnipro-Rudnensky assemblies, the third – like kettles from Kelermes and Kostel (Bokovenko 1990, p. 171, fig. 52). So, the analogies refer these findings to the 6 th-5 th cent., or at least to the early 4 th cent. B.C. The monograph devoted to Chortomlyk clearly shows a tendency to balance “contradictions” and to diminish slightly the archaism of kettles confining them to the 4 th cent. B.C. It is mentioned there that the kettles resembling those from Chortomlyk were brought to the grave far from being new. Apropos, a kettle from the Northern grave has such pattern that it integrally blends with a kit of kettles from chambers 5 and 1. It is worth mentioning that they left safe kettles near the tsar, and kettles with traces of repair beyond his chamber, i.e. in the Northern grave and in chamber 1. The archaism of kettles may be attributed completely to the personality of the main deceased. If we take into account that it was a person of a rather old age who inherited those things (an analogy with Solokha), there will be no contradictions in this situation. 5 . A tendency of arrangement of horses in the submound space which may be treated as a system of outstripping proofs attracts attention when comparing all three tsar burial assemblies of the second half of the 4 th cent. B.C. So, if we take horses from Chortomlyk arranged in three separate graves, it will be anachronism with respect to Ohuz and even more to Alexandropol’ as it continues traditions of Solokha and of other more ancient graves. We ought to remember that some horses from Chortomlyk were, probably in the dromos (“the robber’s hole”). In Ohuz most of horses was brought to the dromos and in Alexandropol’ only one horse was left in a separate pit at the level of the ancient surface, other 20 or 16 horses were put to the dromos. It worth mentioning in this aspect mound Zhovtokamianka, where in line with a tradition a separate horse’s grave was made on a burial way and was left empty and horses were put in the dromos. As to Ohuz we wish to mention that it has reflected brightly a combination of features intrinsic to both the Scythian and Bosporian burial rites, which is not typical of such relics. We have in mind: the Bosporian stone-made sepulchre which is included to the Scythian burial structure; existence of a splendid antique sarcophagus in the Northern grave instead of a wicker coffin or a stretcher; golden adornments of high artistic merit which are unique for Scythia and which analogues take their origin from rich Bosporian sepulchres; combination of the Scythian and Greek decorative elements in adornment of the hearse; appearance of tracery samples in the kit of golden applicative adornments. As a whole, Ohuz is the most Hellenistic relic among the graves of the Scythian tsars. Thracian bridle kits which are not represented in Chortomlyk but are present in other assemblies of later periods make Ohuz somewhat younger. As other assemblies we mean Khomina and Chmyreva graves, Kozel, Krasnokutsky mound, mound № 11 near. vil. Gyunovka and mound № 2 near vil. Bolshaya Znamenka. They all belong to the latest third of the 4 th cent. B.C. 8 . a fire-pot left near the entrance to the chamber. Alexandropol’ traditionally treated as a relic of a turning-point between two centuries was referred to the period between the last third and last quarter of the 4 th cent. B.C. (Alekseev 1986, 35-37; 2003, 270; Monachov 1993, 69-70; 1999, 432-438 ). It has become a habit to comprehend this relic as such which consists of two or even of three burial assemblies (Rostovcev, 1925, 428-430; Mozololevs’kyj, 1979, 154). We are deeply convinced that Alexandropol’ is a single synchronous assembly of underground structures aimed to ensure in the proper way a transit of the most important person in the state to the other world. There are many facts which confirm the synchronism of the whole assembly. 1 . Coincidence and coordination of depths of entry pits and dromoses with allowance for the fact that the long dromos is horizontal and the burial chamber itself has an inclined floor (here and after regarding Alexandropol we shall use the materials of Scientific archives Institute of the history of material culture Russian Academy of Sciences p. 1, arch. 561, 1,7,8). 2 . A slight detail on the sections of undergrounds, namely, an inclination of the floor at the very small part of the burial chamber in a point of its contiguity with a long dromos, demonstrates that it was impossible to make that part of the floor inclined after construction of the chamber. This fact confirms that the chamber and the long dromos were made simultaneously. 3 . Mutual arrangement of axes of both dromoses which make an angle of 110° is in favor of synchronism of the assembly of the Central burial structure in Alexandropol’. Similar indices are observed in Ohuz, Chortomlyk, Zhovtokam’ianka. That coincidence could not be occasional and confirmed preliminary laying out of the submound surface prior to erection of the initial embankment. 4 . Indivisability of the Central burial structure is confirmed by the so-called robbers’ holes (the 5 th and 6 th according to the plan) which, taking their start in angles of the chamber, then embraced it by symmetrical arcs. It worth mentioning that entry orifices of the western hole coincided precisely with the floor level in the chamber with allowance for its inclination. When the edge of the eastern hole get to a narrow contiguous part of the long dromos (gallery 7) at the level of its floor not breaking the grave of a “guard”, its southern edge was “by 1,5 arshins (1,06 m) higher than the floor of the catacombs” (Drevnisti 1866, 13). The holes can hardly be associated with robbers as they do not discord with the general scheme of underground structures and, moreover, the soot on the vault in the eastern hole shows that there burned a wick lamp which is to be treated as an element of the burial ceremony. The fact that entry orifices of the southern hole do not coincide in height may show that the eastern hole might be made prior to the western hole when the floor of the chamber had not yet been dropped by 1,5 arshins and the chamber was not looking as a completed one. The North-Eastern grave performed additional functions with respect to the Central one. It is confirmed by both the planigraphic analysis and conformity of the grave size with a rather unpretentious burial place of a man of “large stature and strong figure” (Drevnisti 1866, 23). This impression gets even stronger due to the presence of large hearse and a pit-bophre 4 m deep. So, this grave does not break the chronological sequence of the whole assembly of Alexandropol’. Summing up the review of all three burial assemblies we think it necessary to emphasize that irrespective of the rather obvious chronological sequence Chortomlyk – Ohuz – Alexandropol’, they are very close in time, which is a certain historical phenomenon. Proceeding from the fact of existence in Scythia of the 4 th cent. B.C. of a rather verified range of four graves which belonged to tsars and basing on the minimum fifty years long gap between Solokha and three other giant mounds we shall try to represent our own version taking into account narrative information. Solokha is the burial place of Atei’s predecessor, Atei himself was buried in the earliest of the three mounds mentioned. In our opinion it is Chortomlyk. We need to note here that we believe Atei was the tsar who had completed integration of the whole Scythia under the segis of the single central power. 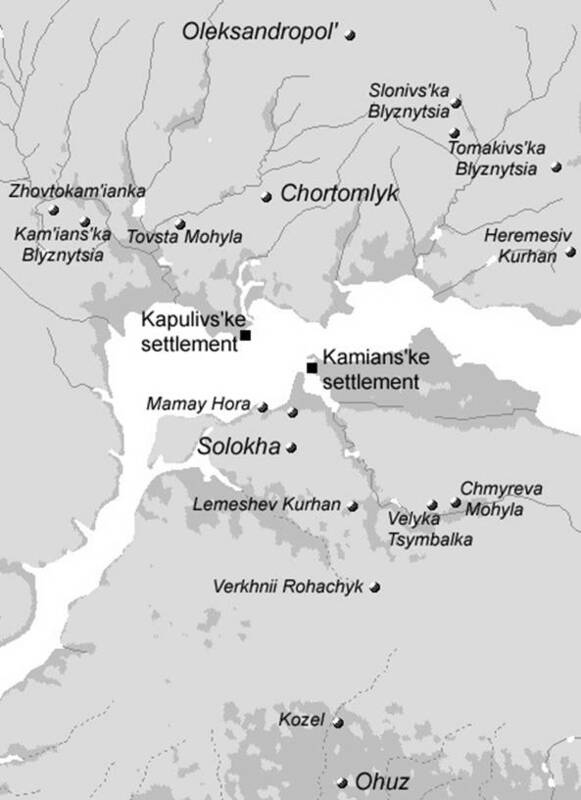 It was under his reign that development of the Scythian state reached its acme and the general-Scythian political and administrative centre was made in the Kamenka site on the Dnipro river ( Grakov 1954, 22-24, 57). We are prone to accept this version taking into account that various written sources represent Atei as an equal partner of Philip Macedonsky (see Plutarch, Aphorisms of tsars and commanders, 16, 1, 2; Pompius Trog, IX, 2) and numerous records of him in written works of Greek and Latin authors had hardly been made if he would be an insignificant governor of one of the regions in Scythia. In the monograph devoted to Chortomlyk the authors practically approached the comparison of Atei’s sepulchre with that burial assembly, but they did not dare to develop that hypothesis as they were in captivity of another version (Alekseev, Murzin, Rolle 1991, 136-138, 141, 142). In contrast to them we believe Chortomlyk is such a mound which is most of all the sepulchre of Atei, as reasons mentioned above, when we have described our version, find quite convincing confirmation. In our opinion the acknowledgement that the Northern grave is a constituent part of an entry pit to the Central burial structure of Chortomlyk, i.e. the beginning of the main entrance to tsar’s burial-vault, attaches quite other meaning to the finding originating from this place. It is a silver bowl on the bottom of which two lines of Greek letters are inscribed (it would be reminded that black-lacquer basin that was found in V th burial chamber of Chortomlyk had graffiti “A” on it’s outside (Alekseev, Murzin, Rolle 1991, 82)). We think it possible to treat the first line as the name of Atei. In fact, it is written either with an error or with a will to show the Scythian pronunciation. Nevertheless that spelling is ruther similar to the representation of Atei’s name on his coins of the late series (Fig.4). Then, if Atei was buried in Chortomlyk, to whom we should refer the Central burial structure of Ohuz? It is necessary in this case to pay attention to information of Pompius Trog that Atei promised Philip to adopt him as a son and to make him the heir but having quarreled with him he declared that he did not need any successor when his own son was alive (IX, 2, 4). So, if there was a son, most likely he inherited the father and became a tsar after Atei’s death. Taking into account the old age of Atei, his son might be not younger than 65-75 years and that is why a chronological interval between the time of construction of Chortomlyk and Ohuz was so negligible. The year of the death of Atei’s successor probably corresponds to the statement of Arian (Campaign of Alexander the Great, IV, 15, 1) that during the embassy of the European Scythians to Alexander Macedonsky to Middle Asia in 329-328 B.C. the tsar of Scythia died and the throne passed to his brother. Apparently, Ohuz is to be attributed to that date, thought, quite possible, there was an intermediate data. The Bosporian properties of Ohuz ought to be attributed to the political alliance between the Scythians and Bosporian tsar Leuconus I (390-348) (Polien, 6, 9, 4) which might be concluded in the first quarter of the 4 th cent. B.C. Attei needed that alliance, possible, for ensuring the success of his expansion to the Balkans and supported the alliance by the dynastic marriage of his son to one of Bosporian princess. This version is confirmed, in our opinion, by the following conclusions: the Northern grave of Ohuz was a burial place of an old woman, probably tsar’s wife; her age corresponds to the supposed age of Atei’s son; the burial stock includes golden crepundia ( Fialko 1994 , 121-124 ). Undoubtedly, those crepundia given to that woman as adornment and an amulet when she was a child were brought to Scythia as her dowry. Only Bosporian relics have certain finding corresponding to those things and there are none such things in the Scythian relics. The same with recherche ear-rings adorned with sphinxes: only rich Bosporian sepulchers have their analogs. So, we may comprehend the presence of the antique burial vault in the Scythian grave. Probably, the wife of the late tsar asked Bosporian workers to construct the burial vault with the aim to immortalize the memory of his husband as Arthemisia did. If we shall take into account information of Arian that the late tsar was succeeded by his brother, in this case also we may suppose the elderly age of the new tsar. Probably, long-term rule of Atei and his elderly age caused further gerontocratization of the Scythian succession to the throne. That very fact is demonstrated by the chronological proximity of tsars’ graves in the second half of the 4 th cent. B.C. The elderly age of the deceased buried in Alexandropol’ confirms this fact as well. Alekseev A.Yu. 1981, K voprosu o date sooruženijaČertomlykskogokurgana ASGE, 1981, 22, p. 75-83. - 1984, O meste Čertomlykskogokurganav chronologičeskoj sisteme pogrebenij skifskoj znati IV-III do n.e., ASGE, 1984, 25, p. 65-75. - 1984a, Rukojat’paradnogo achemenidskogo meča iz Čertomlykskogo kurgana, SGE, 1984, 49, p. 49-41. - 1986, Grečeskaja keramikaiz Aleksandropol’skogo kurgana, SGE, 1986, 51, p. 35-37. - 1987, Zametki po chronologii skifskich stepnych drevnostej IV do n.e., SA 1987, 3, p. 28-39. - 1992, Skifskaja chronika, St. Peterburg. - 1993, Unikal’nye ukrašenija iz Aleksandropol’skogo kurgana, Peterburgskij archeologičeskij vestnik, 1993, 6, p. 72-75. - 2003, The chronography of European Scythia (7 th – 4 th centuries BC), St. Petersburg, (in Russian). Alekseev A.Yu., Murzin V. Yu, Rolle R, 1991, Čertomlyk (Skifskij carskij kurganIV do n.e.). Kiev, 1991. Alexandresku P. 1967, Ataias, Studii Clasice, IX, 1967. Andrukh S.I. 1995, Nizhnedunayskaja Skifija v VI – nachale I v. do n.e. (Etno-politicheskiy aspekt). Zaporozh’e, 1995. Anokhin V.A. 1973, Monet a Ateja , Skifskie drevnosti, Kiev, 1973. Anučin D.M. 1909, I.E. Zabelin kak archeolog v pervuju polovinuego naučnoj dejatel’nosti (1842-1876), Drevnosti: Trudy Imperatorskogo moskovskogo archeologičkogo obščestva, Moscow, 1909, vol. 22, vyp. 2, p.63-68. Bokovenko N.A. 1990, Skifskije bronzovye kotly Severnogo Pričernomorja (k probleme vydelenija kulturnykh tipov). Drenie pamjatniki Kubani, Krasnodar, 1990. Boltryk Yu.V. 1990, Suchoputnye kommunikacii Skifii, SA, 1990, 4. Brashiinskij J.B. 1965, Novye materialy k daterovke kurganov skifskoj znati Severnogo Pričernomorja, EIRENE, Praha, Vyp. 4, p. 89 – 109. Chernenko E.V. 1987, Legenda o care Ateje, Tezisy dokladov vsesouznogo seminara „Kimmerijcy i skify”, II, 1987. Chernenko E.V. 1984, Skifo-pesidskaja vojna, Kiev. Drevnosti... 1866, Drevnosti Gerodotovoj Skifii, S.Peterburg, 1866, Vol. 1. Grakov B.N. 1950, Skifskij Herakl, KSIIMK, 1950, Nr.34. Herz W. 1997, Ergebnisse zum skythischen Ma ß system innerhalb des Garbbaus, R.Rolle, V. Murzin, A. Alekseev, Königskurgun Čertomlyk, Hamburger forschungen zur archäologie, 1997, band 1, teilband III, bielage Nr.8, s. 77-86. Ismagilov R.B . 1994, Skifskaja legenda i rannesarmatskije carstva, Problemy skifo-sarmatskoy archeologii Severnogo Prichernomoria, Zaporozh’e, 1994, p. 69-.71. Kallistov D.P. 1969, Svidetel’stvo Strabona o skifskom carstve Ateja, VDI, 1, p. 125-130. Khasanov A.M. 1975, Social’naja istoriaskifov, Moscow. Mancevič A.P. 1987, Kurgan Solokha, Leningrad. Minasjan R.S. 1997, Zur Herstellungstechnik der Gold- udn Silbergegenstände, R.Rolle, V. Murzin, A. Alekseev, Königskurgun Čertomlyk, Hamburger forschungen zur archäologie, 1997, band 1, teilband III, bielage Nr.13, s. 167-184. Monachov S.Yu. 1993, K chronologiiAleksandropol’skogo kurgana, Tezisy dokladov II Kubanskoj konferencii, Krasnodar 1993, p. 68-70; - 1999, Grečeskie amfory v Pričernomor’e. Kompleksy keramičeskoy tary, Saratov. - 2003, Grečeskie amfory v Pričernomor’e. Tipologia amfor veduschich centrov-ekspoterov tovarov v keramicheskoy tare, Saratov. Mozololevs’kyj B.M . 1979, Tovsta Mogyla, Kyjiv, 1979. Onajko N.A. Antičnyj import v Pridneprov’e i Pobuž’e v IV – III v.v. do n.e., SAI – DI – 27, Moscow, 1970. Pavlenkov V.I . 1999, Car’Atejvsvidetel’stve Strabona, Problemy skifo-sarmatskoy archeologii Severnogo Pričernomoria, Zaporozh’e, 1999, p. 194-196. - 1994, Geraklejskoe klejmo izkurgana Čertomlyk, Tezisy dokladov meždunarodnoj konferencii, Nikolaev, 1994, p. 105. Raevsky D.S. 1977, Očerki ideologii skifi-saksikikhplemen, Moscow. Rostovtsev M.I. 1925, Skifija i Bospor, Leningrad, 1925. Shelov D.B. 1965, Car’Atej, Numizmatika i sfragistika, vypusk 2, Kiev, p. 16-40; - 1971, Skifo –makedonskij conflictv istorii antičnogo mira, Problemy skifskoj archeologii, MIA 177, p.54-63. Shelov-Kovedyaev F.V. 1984, Istorija Bospora v VI-IV v.v. do n.e., Drevneješie gosudarstva na territorii SSSR, Moscow. Fialko E.E. 1994 , Zolotye krepundii iz Ohuza, Drevnee Pričernomor’e. Kratkie soobščenia Odesskogo archeologičeskogo obščestva, Odessa, 1994. Fig.1. A map of location of burial monuments of the Scythian aristocracy in the steppe Dnipro territory. Fig.2. 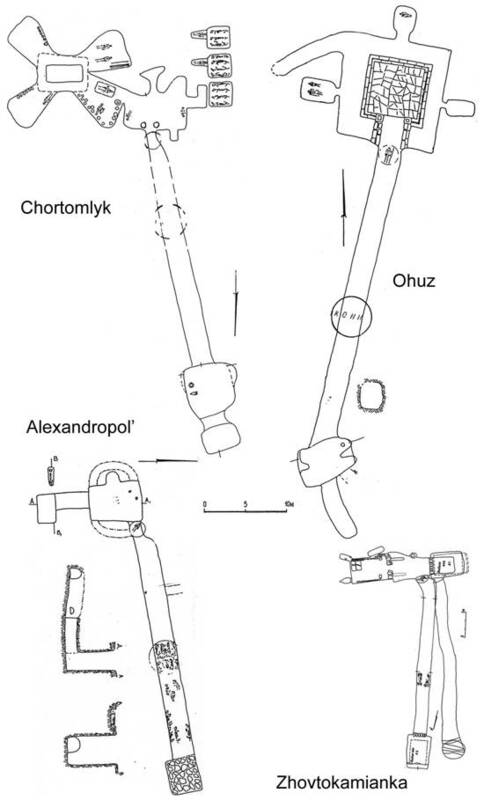 Schemes of central burial structures: Chortomlyk, Ohuz, Alexandropol’ and Zhovtokam’ianka. Fig.3. Scheme of succession of Scythian royal barrows of the 4 cent. BC. Fig.4. Spelling of nomin Atei. Fig.4a. The silver bowl from Chortomlyk (a) and probability nomin Atei (b).